At the 4th international Planetary Defense Conference (April 13-17, Frascati, Italy), proposals were aired for ground-and space-based systems designed to detect asteroids that pose a risk of Earth impact and different methods of deflecting or destroying asteroids found to be on an impact course with Earth. For a summary of PDC presentations on the Jet Propulsion Laboratory’s proposed space-based near-Earth object survey telescope, called NEOCAM; the B612 Foundation’s proposed Sentinel space-based NEO survey telescope; and a comparative analysis of the two proposals conducted at the request of the White House Office of Science and Technology Policy, see this report in Space News. You can also watch the archived webcast of PDC talks by Amy Mainzer/NEOCAM, Hal Reitsema/Sentinel, and Bhavya Lal/Science and Technology Policy Institute (these three talks start at about 45:00). As Reitsema explained in his PDC talk, the Sentinel project has now coupled itself with the Large Synoptic Survey Telescope (LSST http://www.lsst.org/lsst/ ) project, due to come on line in 2022 (if work stays on schedule). This information is out of date. The National Science Foundation and the Department of Energy are the primary sponsors of the project. In July 2012, NSF reported that LSST would cost about $665 million. In March of this year, LSST Director Steve Kahn reported to the Space Studies Board’s Committee on Astronomy and Astrophysics that LSST would cost $681 million, with construction scheduled to be complete by September 30, 2022, and full science operations planned to begin in 2023. LSST operating costs are estimated at $37 million a year (2013 U.S. dollars) over a 10-year period. On to asteroid impact “mitigation” ideas – I put mitigation in quote marks because some of my colleagues have questioned the labeling of asteroid deflection or destruction concepts as impact mitigation options. Impact mitigation is more a matter of disaster planning and response, in the event that an Earth impact should occur…. There’s a lot yet to be learned about hitting or moving an asteroid. 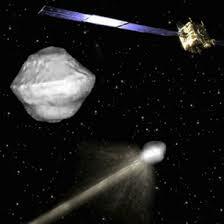 (And it should be noted that most of what’s known about asteroid deflection is a product of computer modeling. Keith Holsapple of the University of Washington observed at the conference that modeling results can be iffy.) One message I took home from PDC 2015 is that there’s no all-purpose asteroid deflection approach. Every asteroid is different, and every close approach and impact hazard is different, so deflection options will have to be developed case by case. PDC 2015 offered considerable discussion of “the nuclear option” – that is, using nuclear “devices” to disrupt or destroy an asteroid on a certain impact course with Earth. A contingent from the Department of Energy weapons labs (Livermore, Los Alamos, Sandia), along with university researchers and NASA specialists, offered a range of perspectives on the nuclear option as well as kinetic-impactor concepts. As Paul Miller of Lawrence Livermore National Lab noted, “composition plays a central role in how an asteroid reacts to a kinetic impactor or nuclear deflection.” Dan Scheeres of the University of Colorado raised the question of how shape and topography might affect a kinetic deflection attempt. Laser ablation or nuclear blasts are sensitive to surface topography. Ion beam deflection is not affected by these factors, as ions implant into the surface and do not “reflect,” he said. Kirsten Howley of Livermore addressed the importance of the composition of the asteroid and the spectrum of the device in the case of a stand-off (off-surface) nuclear deflection attempt. “Existing devices can deflect essentially all NEOs,” Dearborn noted, so there’s no need to develop new nuclear devices for planetary defense. He also noted that nuclear warheads are not an option for planetary defense as they are designed to withstand reentry into Earth’s atmosphere. Philip Lubin of the University of California-Santa Barbara said directed-energy deflection is a very practical option. “I think it’s ridiculous not to have planetary defense [systems] pre-deployed,” he asserted. Young people “enjoy blowing up everything they can,” he said, so why not place directed-energy deflection systems in space for planetary defense and, while they’re waiting for an asteroid target, let them be used to blow up space debris? Brent Barbee of NASA Goddard Space Flight Center reported on a study being led by Iowa State University’s Asteroid Deflection Research Center of suborbital asteroid interception and fragmentation for very-short-warning-time impact scenarios. This concept involves a high-altitude interception by a Minuteman III missile. Bob Weaver of Los Alamos described a mission concept for a hypervelocity asteroid impact vehicle (HAIV) to intercept NEOs as small as 50 meters. This concept involves a two-body spacecraft, with one performing a subsurface nuclear explosive detonation (that is, contact versus stand-off) within 10 meters of the NEO center. Modeling shows that a low-density impactor would not go deep enough. This “leading impactor” needs to be redesigned to be a “penetrator.” Bong Wie of Iowa State’s Asteroid Deflection Research Center said he is seeking funding to develop an emergency asteroid defense project, involving a non-nuclear multiple kinetic impactor vehicle that would vaporize or pulverize or vaporize 50-150 meter objects. “A lot of people would not like to have nuclear testing in space,” he said. There were many more talks at PDC 2015. I offer just a few highlights. While talks at the conference revealed a lot of progress on planetary defense mission concepts and designs since PDC 2013, it appears that the nearest-term possibility for a planetary defense demonstration mission might be the NASA-ESA Asteroid Impact Deflection and Assessment project (AIDA) – including NASA’s Asteroid Impact Mission (AIM) demonstration and ESA’s Double Asteroid Redirection Test (DART). This mission concept study, begun in 2011, has just proceeded to Phase A this year, with a proposed launch date of 2022. The current schedule for the robotic segment of NASA’s Asteroid Redirect Mission (ARM) – which will collect a multi-ton boulder from the surface of a large near-Earth asteroid and include a demonstration of the “enhanced gravity tractor” method for planetary defense – calls for a launch in 2020, asteroid rendezvous in 2022, and planetary defense demonstration in 2023. This schedule is contingent on many factors, perhaps the most important one being whether ARM survives the annual budget process over the next few years and a presidential transition in 2017. About 4 years ago I was curious about the B612 take on deflection and emailed them about the use of nuclear weapons and they seemed extremely unhappy that anyone would suggest doing that. That was the impression I got anyway. I came away form the exchange suspecting B612 will entertain only one solution- their very own “gravity tug” concept. That so many of our so-called planetary defense proponents are against using the most powerful devices ever created to prevent a civilization destroying event- makes me wonder if we are too stupid to survive as a species. One deflection technique you don’t mention is that presented in a talk by Juan Luis Cano, of Spain’s Deimos Space: He proposed moving an asteroid by firing an ion rocket engine in its direction. From the numbers in his presentation, this was both cheaper and more effective than either a kinetic impactor or a nuclear blast, and simpler to build too, with all the required technology already existing and space-tested.